Last week I had so many projects going on at once, and to give you a good understanding of my situation, I thought I'd share a little project show and tell today! First I should remind you, I've never been one to have just one or two projects going, but after a couple weeks full of many things that kept me more running around in circles and caused much less time for sewing, things got a little busy! My Diamond & Zigs Zag Minimalista quilt, a new making rows quilt in Rapture, new fox pillows finished with Chromatics Pointelle, pillows to match my flower crowns (more on that this week), last minute Valentine's decorating & crafting. And, that's not all! Each day on average I have about four Birthday Crowns orders to fill, felt to cut and organize, several new quilt projects in progress awaiting pictures, surprise gifts to make, let's leave out all the computer work, it's endless! Good thing I love sewing so, so much! So how about you, when it comes to sewing, are you able to stick to just one or two projects at a time, working start to finish? Or, like me, do you sometimes take on too much? Sometimes I just don't even want to look at what I've got going on in my sewing room ~ and yes, I too take on a lot of projects. I'm doing 4 block of the month projects ~ thank goodness they go together pretty quickly. Then there's all the other things ~ I do it to myself tho. I LOVE the first photo of the quilt your making! It looks amazing! Oh, I meant to ask ~ are you making a pattern for that quilt? Hi Elsa! With each panel I did a little tweaking and it wasn't until I made the black & gray piece that I thought I had it perfect. In the end my points didn't match, and although I don't mind that at all, I feel like I need to make a second quilt before I can share the pattern. I have four other quilts I need to start/finish before I can think about circling back around for a revisit. Thanks for being interested, I really appreciate the encouragement! That little mini quilt is so cute. Is there a pattern or did you improv it? First, love your Minimalista quilt. That is looking good! I always have tons of projects going on at once. If I don't feel like sitting at the machine, there is always cutting, hand stitching or fabric pulling to be done. Never a dull moment. You are quite the talented lady. Your projects are lovely! Oh, I always have more than one. My husband thinks I'm crazy! Yes, pretty much! I usually have one that I'm sewing and several others that I'm buying fabric for, planning out, etc. It takes a while, since my sewing time is confined to late evenings and the occasional weekend afternoon. Actually, that brings me to a question - how did you start your business? Have you ever done a post about that? I'd love to make and sew full time but am still thinking about how that works from a business perspective. Bummer. Your last post says new comments are not allowed, even though it is still the 17th. Must be a time zone thing. I work on a lot of projects at the same time too - it helps keep the motivation going as I work on what I feel like working on at the time, and somehow I learn things on one project that helps the next one move along smoother. i have several ufo quilts. some blocks just need to be sashed and put together. just finished up with a top last night. need to make back and then to the quilters. can't believe I stayed with it for 1 1/2 months. my quickest time. sometimes so fun to do something different every night of the week. I agree, I love the fun of bouncing around! Lol, not a chance that I only have one thing at a time going. The little projects keep me going. creating is an addictive thing. I make a list and sometimes have to force myself to stop everything till I can check something off the list. I have way too many things going on at once!! I bore myself if I just work on one project days on end. So sometimes I'll take a break and work on something else. But sometimes that comes back to bite me because I can get overwhelmed by all of my wips. Oh well! I always have tons of projects going at once, some are actually several years in the making, like the queen size paper pieced english garden I am working on. I am actually working on a series of blog posts for my own blog (www.feliciasworld.com) about this topic and how it affects creativity. I saw your quilt in Love Patchwork and Quilting this weekend. Congratulations! It is beautiful! I'll be sure to stop by your blog in a bit! And, thank you for the congratulations, we're all very excited about the magazine! great stuff here. I have the same project pile-up at my house! where is the fabric from that is under your flowered headband, so whimsy, love it. If I have more than 1 or 2 projects going at a time, I never finish anything. I have to make myself finish before moving on to the next project. I'm sorry to say I have ADQD - Attention Deficit Quilter's Disorder. Too many projects going on at once. Oh, yes, I can relate to this, Maureen! I haven't done a full count on how many projects I currently have on the go...but my family is teasing me about my design wall being like a archaeological dig (each layer is another project - I currently have 3 full quilt tops on it and about 5 more WIPs pinned onto it as well... ;o). I have to admit that I find it inspiring to work on several things, but get start feeling overwhelmed if the finishes seem too long in happening. I like to work on one quilt at a time until at least the quilt top is finished. If I don't, my ADHD kicks in and I end up with way too many projects, none of which get finished. I get to "reward" myself with a new project when I finish a project. I love your diamond and zig zag quilt! I can't wait to see the whole thing! I do better one project at a time and I'm really slow! I'm still working on the herringbone quilt you did a tutorial for, but I'm ready to attach the backing now and I'm so excited that it's almost done. I can't manage start to finish, either. But I tend to have (to borrow one of my late mother's favorite phrases) "too many irons in the fire." My word for the year is FOCUS. I don't know how you juggle it all, Maureen! I am amazed. I always take on too much. Then I get overwhelmed and quit sewing for awhile. Right now I have lots going on. I am expecting a baby this spring and have so much I want to make, a blanket, diaper bag, dresses, booties, crochet items. But I also have projects I want to do for my son and daughter. I think I am doing ok for now, trying to get the things I need to get done before baby comes and then work on the other projects. Can I just come and steal one of those quilts?? They are gorgeous! I'm completely guilty of taking on far too much too. Right now I have 2 patterns I'm digitizing, 4 quilts I'm making and spring/summer clothes I'm making up.....I hope my quilts turn out as gorgeous as those though! 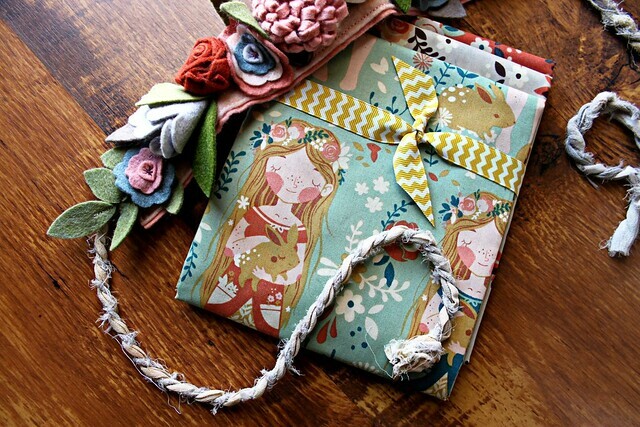 hi.. wondereing what the fabric range is in the second to last photo.. the Rapunzal girl with the rabbit.. ?? "ganddpalmer@bigpond.com"
Beautiful post today! Love so many things about it. It is hard when I have several projects going at one time because I have to shuffle things around so much. I'm happy that I've had several custom orders lately, but it sure cuts into my quilting time! I take on too much! Various stages of completion, but mostly at the stage of "kitted". I had to stop myself from buying anymore project storage boxes! I figure if I can't "kit it up" in a nice box, I won't have so many projects going. You do take the most beautiful photos. I am sure it takes a lot of time to stage them but the product is well worth it! I always wonder when I see photos in your house, does your whole house look like that because I'd be lucky if I had vases on a mantle in my house for ten minutes without someone breaking one. Maybe when my kids are a little older. I like several projects going at a time...when I get bored with one I switch over to another. But like you lots of things keep getting in the way of sewing....I have been working on the accounting books for my son's business (I was an accountant in my previous lifetime) and then I spent 3 days last week helping out at a local flower shop (I used to own my own flower shop) for Valentines day. I can hardly wait to get back to my quilt tops I am working on. After a short vacation weekend next weekend I should be able to get back to sewing...Love your blog Maureen. I am new to sewing. HAven't gotten thread to start a first project yet on my first sewing machine. In general I start too many craft projects at one time and begin another before all of them are finished. Love your new quilt. Thanks for continuing to inspire us.